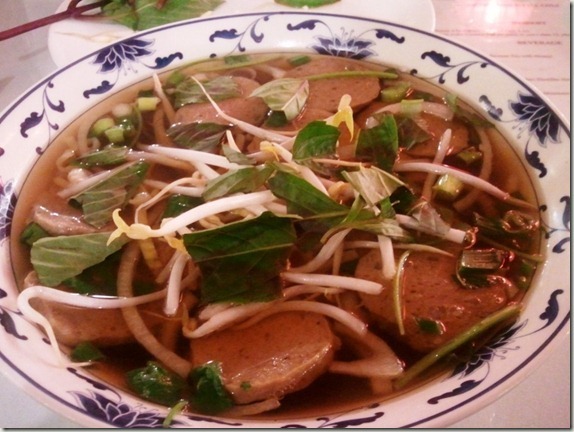 One thing lacking in the UK are decent Vietnamese restaurants…. Ashley and I had a fantastic trip to Ho Chi Minh City, The Mekong and Phu Quoc last year and savoured every bite of their fresh tasting cuisine. One thing American streets are not lacking are eateries from that part of the world, specifically selling Pho – pronounced “fuh”. On Saturday we ventured into Capitol Hill and Broadway in Seattle to visit the famous Pho Than Brothers. Greeted with a plate of fresh herbs, bean sprouts and a cream puff (!) we browsed an extensive menu with included chicken, meatballs (see photo) and about 13 different cuts and selections of beef. Essentially Pho is a noodle soup made with rice vermicelli bathed in a scrumptious broth and fresh veggies adorned with whatever meat takes your fancy. Quick, delicious and cheap, we left (with some extra cream puffs that a preggers Ashers was craving) having imparted with way less than $20 including tip. Thoroughly recommend it and would love to hear your favourite Vietnamese restaurants so we can check them off if we’re in your part of the world.